I met my husband Alan in the 1940's, he worked on the railways, Newhaven Bridge and up towards Piddinghoe. He used to lean over the gate and say "I'm going to marry you" and he did! Alan was one of 11 children, 3 girls and 8 boys, a Newhaven man born and bred. There used to be a train that went over the swing bridge, once a day I think, taking coal to the harbour. A steam train I think? 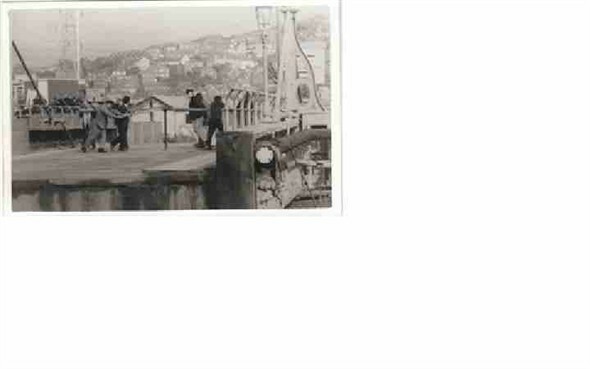 Opening of the swing bridge: the men used to put a pole in the middle of the bridge, with 2 men on each part. They would walk round the capstan to open and close the bridge. Alan and his brothers took turns to do this. This page was added by Sylvia Woolford on 19/03/2008. I think nearly every man in Newhaven has had a go at helping to open the swing bridge. My husband, Arthur, helped as a young man. The hub with 4 sockets and the upright that fitted in the mechanism are in the museum- if any one is hiding one of the wooden spars that was pushed against it would be welcome to add to the other bits! My uncle Tony Shaw helped to open the swing bridge from 1961 to 1973. My father often helped to open the bridge with the capstan. I sometimes stood on the bridge while it was opening and closing. This was in the mid 1950s. I think he may be in one of a photos I found on the site. Happy memories, I would ride around Newhaven mustering men to open the bridge at at top of tide. It took 8 men minimum to operate, 6 would set up the central pillar with 4 spars, one would disconnect the gas and power under the bridge, then winding the gear to lower the bridge onto a massive cogwheel, with a man on each the East and West gates were closed. Then we all pushed together, timing it so the vessel passed through. Sometimes things went wrong and the Pilot on board the vessel had a heart stopping moment, there was no way of stopping the ship hitting bridge as the tide was usually rising. Hope this is of interest, the opening of the bridge was a good money spinner as we got paid 3 hours call out money. THE DAY THEY SHOT AT THE BRIDGE!